Moroccan Cuisine Marocaine: بغرير / Morrocan Beghrir (Baghrir) Recipe or Moroccan Pancakes / Crêpes Marocaines aux Mille Trous! Morocco, Country with Varied Culture! 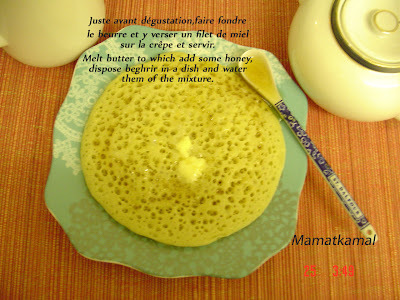 بغرير / Morrocan Beghrir (Baghrir) Recipe or Moroccan Pancakes / Crêpes Marocaines aux Mille Trous! No, no, these are not crumpets! These are crepes of a thousand holes called "Baghrir", pronounced as BAR(French R) =REER (English R) = بغرير . The letters "gh" in the word "Ba gh rir", together are pronounced like the French "R", similar to a gargling sound in the back of the throat, like in the French word "Rivière". On the other hand, the letter "r" in the word "Bagh r i r " is pronounced like the rolling English "R", as in the word "Rain". Baghrir is one of the most well known of Moroccan crepes, originally hailing from the South of Morocco, known as Souss Region, and it is a Tamazight/Shalha name, which means "Too soft". If you call someone, especially a man "Zayd Aya Baghrir", this phrase could be seen as insulting, thus insinuating; "He (the Man) is too submissive, too obedient, too weak, etc.."! These baghrirs are eaten throughout Morocco, especially during Ramadan for breaking the fast, but they are such a great treat anytime! Traditionally, they are served with a sauce of butter-honey, but can also be served plain, with jam, peanut butter or chocolate spread, or Amlou Paste etc....They are readily available in small and large sizes, and can be purchased in most local Souks or big supermarkets. However, there is nothing like a hot, homemade baghrir drizzled with a mixture of butter and honey, making you feel cosy and keeping you happy. Baghrir is so easy to make, and to be honest, you don't even need a recipe to go for it. In fact, if you can make pancake or pudla or crumpet or crepe, you can definitely make baghrir. Everyone can make baghrir, the only thing you need is a honest and clear recipe with cooking tips, then you will learn quickly how to master the making of such a delicious treat! Baghrir is usually made out of hard unbleached flour all purpose or fine semolina, known in French as "Farine de blé dur non blanchi ou semoule très fine", or sometimes, a combination of other types of flour such as; rice flour, or white flour, or corn flour, which are also used on occasion to achieve a certain texture or taste, though these baghrirs are less popular. These little holes that you can see in the top of baghrir are the results of adding baking soda or baking powder to the yeast and thanks to them, thus, allowing baghrir to soak up anything you choose to spread on them, and perfect for holding the butter you will surely want to melt on them. However, my grandmother as well as my mother, never added "baking soda" or "baking powder" to their baghrir batter, and their crepes still ended up with these little, cute and delicious holes on top! What was their secret? Unfortunately, no one in my family can tell! When I was young, I remember how my sisters and I were so excited watching my mother and grand-mother, while they were cooking these delicious baghrirs. We all waited watching what they were doing, counting those little bubbles once they started to pop up all across the surface. When it’s cooked, we ate it all! I usually make baghrir for breakfast on Saturdays, it is our delight of the weekend. It has that light unique, soft, spongy, tender texture with an attractive honeycomb appearance and is cooked only on ONE (1) side. Though best straight out of the pan, they can be made ahead of time and heated up in a hot pan. Don't use an oven or toaster to heat them up, because they will turn out too crispy. Microwaving will just make them soggy, so it is not recommended. I can't believe the size of those holes! Have you ever seen our crumpets? They look like massive version of those. At first, I too, thought these were crumpets. I must try these, and when I do, I shall think of you, my beautiful friend. Wonderful, wonderful pictorial. Thank you for the time you put into this post. Your pictures helped me to see exactly what you are doing. You are among the very best! Wow, these are really interesting. I can hardly wait to try them. They look like what we call English muffins but much larger. Please check my blog for a surprise. Tes crêpes sont une réussite totale. Les trous sont la preuve de ta dextérité. Je vais essayer la technique de la poêle froide car j'utilise une poêle très chaude. Wonderful post, thanks so much for sending it to YeastSpotting! Your blog is lovely. I've never heard of this bread, and it looks fantastic! Magnifiques, ces crêpes. Elles font un peu penser à l'injerra, cette éthiopiennes au teff... Bravo pour ce beau blog pétillant de vie ! 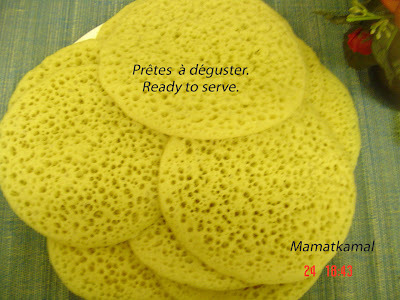 These look like a cross between crumpets and injera (Ethiopian bread)! Delicious either way. i thought they were crumpets aswell! I think I may try them on the weekend for my family, thanks for the great recipe & instructions. I stumble upon your blog through Wild Yeast. Oh my... I have to try this or at least learn from your tips when I make the Indonesian pancakes. Mamatkamal...excellent blog and AMAZING post. These baghrir are the most perfect baghrir I've ever seen! honestly. I read that time ago women were "valued" according to the number and size of holes they got on their baghrir...you would be a queen! :-) I hope you don't mind, but (I'm spanish and recently joined an excellent forum on bread, that though it's in spanish you are sooo welcome to visit and become part of, if you like) so I linked them to your recipe because it is sooo amazing! I just tried to make it...But,my holes weren't as incredible as yours!I had to go just after making the batter, so instead of 30 min. I left it for 3 hours! perhaps that's why! :-) or maybe I added too little water (about 520g) or too little soda bicarbonate (1/4 tsp)...I hope you can guide me in the right direction!Other than that I did cool down the pan from crêpe to crêpe and just turned it on (to number 8 on my induction which runs from 1 to 11...maybe too high?) I think that's what you meant, right? because all other recipes I've seen up to now ladle the batter on a prewarmed pan. Anyway, thank you sooooo much for sharing this wonderful recipe!!! !The forum by the way is on http://elforodelpan.com/ if you want to have a look!I feel obliged for this great recipe, so if you like I also recently started a blog that I hope you can find some recipe you may like. Estos pancakes deben ser una verdadera delicia. Oh wow! I was looking at how to make my own hummus but I got into this site. I am currently working from home selling import export goods online so I have a lot of free time to learn how to cook and bake. I really need to learn! Thank you for this recipe, now that i am working from home i have time to make these treats for my family. Thank you! Baghrir are delicious, much better than american pancakes. I have made them a few times over the fast few days. They have a lot of bubbles, but yours look even better and bubblier! They look and taste like somali/ethiopian/djibouti bread called laxoux, which is similar to injera in technique, but practically equivalent to bghrir in appearance, taste, cooking technique and prep, only laxoux's batter is more sourdough pancake and served with butter and sugar, or dipped in syrupy sweet cha! (somali spiced tea)As I'm married to a Moroccan I'm finding many similarities in Somali cuisine. I'm so happy you've shared this recipe. Thank you so much! Thanks everyone for your visit and your comments. @mimi doudou: Merci et Eid mobarak said à toi aussi et ta famille, je n'ai aucune idée pourquoi la connexion ne marche pas de la France. Passes de très belles vacances au Maroc. Hello/Salam/Azul aytma d'istma, tifawin oflki flaton! Welcome to Morocco! The history of Moroccan cuisine, which includes Imazighens (Swassa, Ryafa, Zayanes), Jews, Fassis, Andaloussis, Sahrawis, Gnawas and Arabs origin, stretches back for several centuries and was able to adapt itself to changes and different modern ingredients from period to period. Moroccan cuisine is rated among one of the most cleverly balanced cuisines, with strong focus on rich flavours, aromas, texture, presentation, choice of spices and fresh ingredients, thus leading Moroccans to pride themselves on eating tasty food on a daily basis. Welcome to my Blog! رزة القاظي-رْزِيزَة /Traditional Handmade Moroccan Rzeeza or Rzate Lquadi (Lkadi or L9adi) / Moroccan Judge's Turban / Turbans du juge-Crêpe Marocaine ou Rziza ou Rzisa! المْخَرْقَة-الشّباكيّة/ Chebakia or Chebakiya (Mkharqua-Mkharka-Mkhar9a)/The Classic Moroccan Flower Cookies / Chabakia ou Chebakiya ou Tresses (Roses) au miel! كعك وجدي/كعك وجدة/Kaâk Wajdy (Oujda ou Wajda) / Moroccan Sunny-Shaped Cookies with Anise, Fennel and Sesame Seeds /Brioches d'Oujda ou Biscuits Marocain sous Forme de Soleil à Base de Graines de Fenouil, d'Anis et de Sésame! غريبة الزّنجْلانْ/Sesame Seeds Ghriba or Ghoriba or Ghriyba Bahla /Ghriba ou Ghoriba ou Ghriyba Bahla Aux Graines De Sésame! قراشل بالبطاطة / Potato Krachel (9rachel) / Spicy Moroccan Potato Buns / Brioches Marocaines aux pommes de terre (patates) et épices! Shamiya (Shameeya)-Kikat Smida-Harchat Fran-Moroccan Semolina Cake / Chamia-Gâteau marocain à la semoule! مْسْكوتة بالرّيْبْ كيكة/Meskouta or Kika Yoghurt / Moroccan Yoghurt Cake / Meskouta au Yaourt / Gâteau Marocain au Yaourt! عَقْدَةْ اللّوز/Homemade Almond Paste Moroccan Style / Pâte d'Amands A la Marocaine! Almonds are the most commonly used nuts in Morocco and where would Moroccan pastry be without them? The almonds, either whole or sliced or toasted or fried or ground with skin on, or blanched, are a staple in Moroccan dishes, as well as dessert pastes. Dough for Moroccan Sweet Pastries / Pâte Pour Pâtisseries Marocaines! This is a dough made from a few ingredients and is widely used in Morocco to make sweet pastries, especially Moroccan Kâab al-ghazal or Kâaba = الكَعْبَة أَوْ كعب الغزال. The most important part of making this, is the kneading and the rolling of the dough. It is amazing how a small ball of this dough could be stretched thin and thinner that you could "read the newspaper through it"! Ras El Hanout- Moroccan Spice Blend / Rass El Hanout, la plus élaborée des épices marocaines! Black Olive Bread Moroccan Style / Pain Aux Olives Noires à la Marocaine! THIS bread, though I always serve it with Camembert or with nice hot soup, it is in fact so delicious on its own. When served as grilled cheese sandwich, this delicately flavoured bread is a dinner in itself! Ras El Hanout Chicken / Poulet à la Marinade de Rass El Hanout! Chicken is one of my boys' favourite meat, either cooked in Tagine (Tajine) or roasted, or fried, or grilled, or whatever I can try. I often use this Ras El Hanout Sauce (Moroccan Spice Blend) to marinate chicken wings or drumsticks. Potato Buns / Buns ou Pain Hamburger aux Patates (Pommes de terre)! In fact I was planning to post this recipe along with many other pictures of potato doughnuts, pizza crust and brioches, few recipes I will be sharing soon, under the title "Potato Dough", but these buns turned out to be such a lovely treat on their own that they are really worth to be posted separately with a few praising words! سبيعات اللوز / Almond Fingers / Doigts aux Amandes! Those almond fingers, commonly known as "Sbi3at Louz" or "Sbiaât Louz" = سبيعات اللوز, that literally means "Fingers of Almonds", are so delightful and delicately flavored cookies from Morocco that have been enjoyed by both adults and children for generations, nibbling on them between sips of fresh mint tea. خبز المْحْراشْ/Moroccan Bread Mahrash / Pain Marocain Mahrach (Khobz L'mahrach)! One of my favourite things about my country culture is the Souk (السّوق = Local market) and for me, it has always been an interesting place to wander. I just like walking through the grand Bazaar, the narrow streets and enjoy the smell of freshly baked bread drifts from Frane (communal ovens = فْرّانْ), and all those aromatic, exotic, colorful spices. The place is filled with vendors, very friendly who bargain with a smile on their faces, and little boys running, with schoolbags bouncing on their backs, all grins and full of energy, and women carrying wassla (االوصلة = Wood Tray) of bread on their heads, and old men selling bundles of fresh mint, absinthium, coriander, parsley and Mahrash Bread (or Marhrach = مْحْراشْ)! الزّعّْلوكْ /Moroccan Zaalouk or Eggplant Cooked Salad/Zaalouk ou Za3louk Marocain aux aubergines! Gâteau au fromage et aux framboises / Cheese and Raspberries Cake! Manhatthan roulade, 2 Awards-Prix and Happy New Yea-Bonne Année! Mary Berry is one of the UK's best known and one of the most respected cookery writers in the country. I love her recipes because they are simple, clearly illustrated and most importantly, I've never tried one of her recipes and it didn't work well. I love posting cakes in my blog, because they help me remember those special moments I shared with my family, and it is more fun when I read the posts with my sons. The Australia's National Dish: Pavlova! I had never heard of Pavlova until I went to Sydney with my husband a few years ago. We went to a restaurant where we had a very nice meal and Pavlova was the dessert I chose to follow. "What is Pavlova? ", my husband whispered to me, assuming I knew what it was since I chose it for dessert. "I honestly have no idea what that could be! ", I replied. It was a sunny and lazy Sunday, my husband and my boys went to a movie. I was in that mood to try something new, and since I had a recipe that I wanted to try a long time ago, but somehow never got around to it, but that day, I decided to go for it. I made Oven-Dried Tomatoes! No, no, these are not crumpets! These are crepes of a thousand wholes called "Baghrir" = بغرير . Baghrir is one of the most well known of Moroccan crepes, originally hailing from the South of Morocco, known as Souss Region. It is a South Imazighn (Shalha) name, which means "Too soft", and if you call someone, especially a man "Zayd Aya Baghrir", this phrase could be seen as insulting in some parts of the Kingdom, mainly in Souss Region, thus insinuating that "He (the Man) is too submissive, too obedient, too weak, etc.."! حَرْشَة / مْبَسّسْ / كسرة/ Moroccan Harcha or Harsha or Kasra or Mbessess! Harcha or Harsha or 7archa حَرْشَة or Mbessess مْبَسّسْ or كسرة is a Moroccan crepe made from a mixture of fine and medium semolina flour or fine cornmeal, then other ingredients are added as butter, oil, yeast, salt, warm water to form a wet dough. However, the newer versions of Harsha use baking powder and milk or buttermilk or even fresh cream or sour cream etc... whereas the original Harsha version contains yeast, warm water, salt, oil and sometimes butter. الرُّوزْ بْمَطيشة/Rouz Matticha/Moroccan Style Cooked Rice/Riz Cuit Style Marocain! "Rouz Maticha", phonetically, pronounced as : /ruːz mætiːsha/ which means "Rice and Tomato" in Moroccan language, is one of my favourite dishes from my mother when I was young. In Morocco, rice is traditionally served with a tomato sauce, especially for supper meals. Who doesn't love pasta! It comes in lots of shapes and styles and I prefer to buy most of the time fresh pasta, only if the price is reasonable. It is the perfect meal for everyone and my children love it, they can eat it every day. If only the cost of fresh pasta was not an issue, I would probably cook it for all weeknight, and all family occasions! "شرمولة مطيشة" = "Sharmoula or Charmoula Matticha" , pronounced as "SHAR-MOO-LA / MA-TI-SHA", is the Moroccan-Style Tomato Sauce, which is one Basic Sauce that goes with almost any type of dishes: From traditional Moroccan food to grilled chicken, steaks, seafood, pasta, rice, couscous, meatballs or kafta, eggs, fish fingers, chicken nuggets etc... It can also be served as a dip-appetizer, with chips or some nice bread. When it comes to create or try a new sauce, it is not that easy, since the sauce that goes with pasta or rice or couscous etc... represents almost 80% of the dish, and I think once you have found the perfect sauce, then you have created a fantastic meal. Croissants Français et Petits-Pains au Chocolat! شرمولة راس الحانوت/Ras El Hanout Marinade For Chicken / Marinade de Rass El Hanout Pour Poulet! If you like sweet and savoury meat, this Ras El Hanout marinade is perfect. It is easy to make, tasty to eat, and fits perfectly the taste of the the roasted chicken wings or drumsticks. "تْفَايَا", = Tfaya, is a very popular Moroccan sauce, made with caramelized onions and raisins and which accompanies the famous Moroccan dish Couscous or Sakssou, and which is prepared usually for special events. Traditionally in Morocco, three (3) days before a Marriage Ceremony, this dish is prepared for the close family members, relatives and friends of the soon-to-be groom and bride. The ceremony is called "Henna Day" = Nhar l'Hanna (نهار الحْنّة), often a Friday, when it is usual for Henna Day, to take place. This wonderful sauce recipe is the culmination of all my attempts and errors, and it is a nice combination of lovely ingredients! It draws its subtle flavor impact from the mallows and the combination of green roasted chile and sour cream. There are so many different versions of green sauce, Iberian, Mexican, Chinese, Spanish etc...... I have tried many different recipes over the years and tried just about every different combination of ingredients and methods for making what is known as "Green Sauce" and I have adjusted, adding Moroccan flavours to suit my family's taste. I now have it where we all like it! After a few months of gloomy weather, finally the sun shined, showing its bright face, there was not one single fog and it was our Spring Break week too. So Spring is here and I wanted to prepare something to remind me of that feeling of renewed life and unsurprisingly the colour green, green beans and Moroccan Flag Salad came to my mind. These Mini-Toghrifts are so soft, pliable and just a little bit chewy. They are perfect for any kind of sandwiches or dipping! They are so delicious and they make good sandwiches! I’m submitting this post to Susan's Yeastspotting, a blog devoted to yeast bread food. Please check it out! This post will be about one of my childhood memories! Each time we sit down at the table to eat, it seems as though, it's not ME but it's my MOTHER (passed away many years ago), who is serving us one of her mouth-watering lunch or dinner. The reason I feel that way is that I cook so many of the same dishes and recipes that my mother used to make. All her old traditional recipes that she learned from my grandmother and that my grandmother learned from her mother etc.... Same dishes, same mum and grand-mum styled-home-cooked food, same taste and aroma! I can't let go all these food childhood memories and how could I? My mother was one such Mother! Each time I am in the kitchen cooking a meal I grew up on, this meal brings my mother to me in spirit and I feel she's smiling down on me! مْسْمّْنْ/Moroccan Mssamen or Msamen/Mssamen ou M'ssaman Marocain! These are Moroccan Mssamen, sort of crepes, absolutely delicious! Melwy =مْلْوي means in Moroccan Darija "Rolled dough" = "La pâte roulée" in French. It is another traditional, typical Moroccan West Crepe. It is made in the same basic way as Msamen and Rziza, except that Melwy has much more layers, due to its snail shape. The main ingredients of a traditional Moroccan Melwy base are made from hard unbleached flour all puprose, fine semolina, water, yeast, pure olive oil, Oudi (only, if you like the taste), some butter and salt to taste. Like Msamen, Meloui slightly rises up during baking due to the use of fine semolina and butter between layers, and also from the air that gets trapped between the layers. When cooked, Melwy becomes so light, tender and soft. Really delicious! شلادة مطيشة وْ الفْلْفْلَة مْشْوية/Moroccan Tomato and Green Roasted Pepper Salad! This is one of my whole family's favourite salad, very tasty, and easy to prepare. Each time this salad bowl makes its way around the dinner table, and most of the time there are only a few tomatoes and peppers slices left in the bowl, my children's eyes dart around the table to see who grabbed more than their fair share! We call it the "Queen" of all Ghoribas or Moroccan Macarons. This is one Melt-in-the-Mouth-Treat made of blanched almonds, whose lightness comes from being made with ground almonds, powdered sugar and with no flour in it. So delicious! The Pinwheel aux amandes et confiture - Danish Pastry! أتايْ السُّوسِي /Thé Marocain Soussi à la menthe (Région de Souss-Sud du Maroc)! مْلْوي مْعْمّْرْ/Moroccan Meloui Stuffed with Cheese, Cachere and onions! This is Stuffed Moroccan Melwi, sort of crepe, really delicious! It was cooked on a frying pan over medium heat. أُودِي/Recette d'Oudi ou Oudy (Sman ou Smen baldi de la région de Souss du Maroc)! Oudi ou Oudy est une sorte de Sman (Smen baldi) de la région de Souss du Maroc! On l'appelle aussi Sman Soussi! Tellement bon, facile à faire et ça se conserve bien! 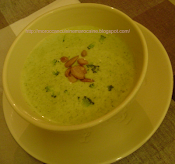 Warm up with Moroccan Cornmeal porridge! It’s so interesting how people choose their favourite breakfast dish from all around the world. Some start their day with eggs, beans, sausages, potatoes, tomatoes, rice, filled buns, toast, croissants etc.... and others will drink a bowl of Askif, as my mother used to have for breakfast! Askif, pronounced as (AS-KEE-F) is a dish made by boiling some types of flour, corn, semolina, barley flakes or grits, etc.... in water, or milk, or both (but usually milk is added at the end of cooking), and then the whole thing is stirred up like a soup. In some regions of Morocco, other grains, spices, seeds, herbs and vegetables are added to make Askif. Roll au Chocolat et Cannelle, Spécialité Nord-Américaine! Muffins aux Deux Chocolats et Fromage à la crème, une spécialité Nord-Américaine! Le "u" dans le mot "M u ffin" est pronnoncé comme la lettre "a" dans la langue française, ainsi le mot est pronnoncé comme "MAFN". Les Muffins nous arrivent tout droit de l'Amérique du Nord où ils sont très populaires et incontestablement un "must" à consommer sans modération. Pinwheels aux Epignards, Spécialité Nord-Américaine! / Spinach Pinwheels, North American Specialty! Pear and Lime Smoothie/Milkshake, Moroccan Style! All you need is add a decorative paper umbrella to accompany this juice, garnish with a lime wheel and it will make you feel like you are in Agadir Beach, relaxing under the sun with toes in the sand! Summer comes early this year and what a week! When hot weather rolls around, nothing quite quenches your thirst like a cold fresh fruit! Moroccan Kefta Tagine with Tomato and Eggs! Today I'm sharing Moroccan Kefta Tagine that I made a few weeks ago. I've received several e-mails from readers, requesting the recipe for this dish, and first I would like to apologize for the delay. Kefta Tagine is a divine meal prepared with tomatoes, kefta and eggs, and the happy marriage of these three (3) ingredients has made this Tagine the national dish in Morocco, after of course Bastilla or Pastilla (Moroccan Pie), Couscous/Saksou, Safa/Seffa and Mrouzia/Mroaziya. What is Kefta or K'fta? Pronounced as (K-FTA) in Moroccan Dialect, it simply means minced or ground meat, of either beef or lamb (or a combination of the two), or chicken or turkey. Kefta is typically mixed in a marinade of few ingredients; traditionally, it is olive oil, salt, ground cumin, red paprika, ground black pepper, minced onion, minced garlic and chopped coriander/parsley. The mix and Kefta are kneaded thoroughly to distribute flavorings through the meat, then rolled into small meatballs. إِباوْنْ- مْنْكوبْ/Mangoob/Moroccan Broad or Fava Bean Salad! We call them "Ibawn =إِباوْنْ " in Tachalhit or Imazighen, and "Fool" or "Ful = فُولْ ", in Moroccan Darija, elsewhere they are commonly known as fava beans, broad beans, horse beans or windsor beans etc.... When I was a kid, I tried to grow fava beans in a glass! So I got a clear drinking glass, put some shredded newspaper to hold my beans inside, then put 4 or 5 fresh shelled fava beans in the center and poured a few cm of water. I was sure I could actually make fava beans sprout in my glass! So there sat my glass, on our kitchen windowsill, and dutifully I watered or rather over-watered the beans every single day, waiting several weeks for a sprout to appear or for something or anything to emerge. Nothing, I gave up on my fava beans! Pomegranate and Strawberry Smoothie, Moroccan Style! In Coran or Quoran = القرآن, it is called the "Fruit of Paradise"! In Moroccan Darija, we call it "Rman = R-MAN" = الرّْمّانْ, it is the Pomegranate Fruit! I have wonderful childhood memories of eating and enjoying this fruit, and have loved eating these gorgeous ruby red seeds since I was a child, especially when served for desserts. My mother would break open three or four pomegranates, fill up a bowl of those ruby-like seeds, add a segment of mandarin and some fresh orange juice, then sprinkle some icing sugar and ground cinnamon on top, then finally add the magic touch of orange blossom water. So delicious! I already talked about Harsha (Harcha) in my last post a few months ago, so I won’t blab again (Here is the Link for my last post about this bread). I frequently turn to this stuffed harsha when there is no bread to serve with Harira or any type of soups for supper. This is a classic harsha recipe that lends itself to endless possibility and variation. I like to use cheese cream with coriander, but you can use any herbs or soft cheese that suit your preference, and you can use either fresh or buttermilk powder. It really tastes great when warm, a perfect blend of soft and crunchy texture, and I think it is the buttermilk that makes this harsha deliciously moist, giving it loads of flavour. It was soft and crusty with a lovely mild flavour, compared to a nice sourdough-ish taste, segueing into hot metlted cheese and olives mixture, cooked to a perfect melding of flavors. I just have to exercise great self-control to stop at ONE harsha. My all-time favourite blogs & Sites! Free Lecture by Naima Lahbil - SHARE THIS! 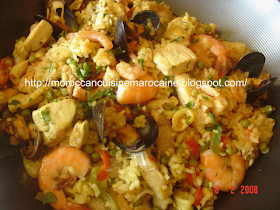 Copyright Moroccan Cuisine Marocaine - 2007 - . All rights reserved.